If you are wondering about what you can do to take a good care of your feet, you should consider trying out a vinegar foot soak. While using vinegar may sound a bit strange at first, if need to remember that you tend to use vinegar for many other things, not only for cooking. You can use vinegar to clean as well as to make sure that your feet don’t get stinky, aching, or even tired. 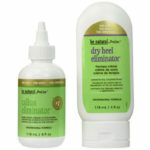 Discover how to treat your feet as they deserve. One of the best things about vinegar is the fact that it is a diluted form of acetic acid that is harmless. In addition, vinegar also has important antifungal properties. Since vinegar can work as a disinfectant, when you make a vinegar foot soak, it will help you get rid of the bacteria that make your feet smell. Before you actually soak your feet in this solution, you need to wash your feet well with water and soap. Other things that can help eliminate the foot odor are wearing breathable shoes such as canvas or leather as well as wear wool or breathable cotton socks. Try out a Listerine foot soak. When you notice that your feet are dry and cracking, nothing better than a good vinegar foot soak. Make sure that you use cool water in your soak. In this case, you should do the soak at night before going to bed. After soaking, apply a good moisturizer and put on some socks. In case you have warts or calluses, this vinegar foot soak can also help you. After all, vinegar is a mild exfoliator. So, just soak your feet in the solution and then use a pumice stone to get rid of the hardened skin. Discover how to prevent calluses on hands. Simply put, athlete’s foot is a fungal infection that affects your toes. So, if you notice them appearing red or your skin peeling, you may have athlete’s foot. In addition, this condition can sometimes cause itches and burns. Since vinegar has antifungal properties, a vinegar foot soak can also help. All you need to do is to soak your feet in this solution between 10 to 15 minutes every day until the infection goes away. Please notice that this treatment may take a few days to show some results. So, how can you make a vinegar foot soak? 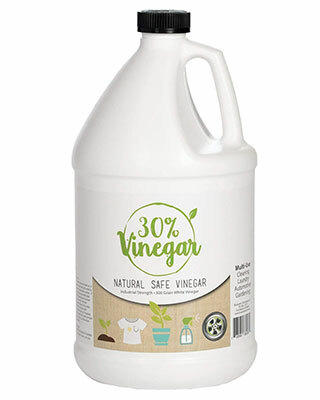 While vinegar is not dangerous and doesn’t harm your skin, we believe that it is better to be used diluted. Usually, you should use 2 parts of water and one part of vinegar. READ Listerine Foot Soak - Is It Worth To Give It A Try? The Bluewater Chemgroup 30% Vinegar Concentrate is perfect to use not only on your mixture but also to cook and clean. It is made in the United States. 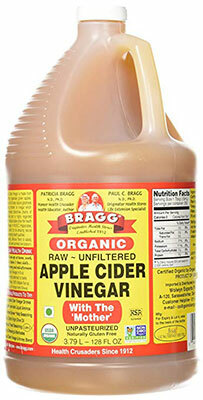 In case you prefer organic vinegar, the Bragg Organic Raw Apple Cider Vinegar is a great solution. In addition, since this is an apple cider vinegar, the smell won’t be so intense when you are soaking your feet. 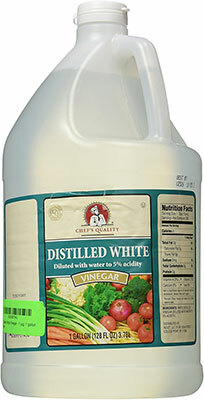 The Chef’s Quality Distilled White Vinegar is another great option that you have. This 1-gallon package will last for a very long time even if you also use it for cooking and cleaning. Listerine Foot Soak – Is It Worth To Give It A Try?